Football Rules is an Online Video Slot consisting of 5 reels and 20 pay lines and has a football theme. 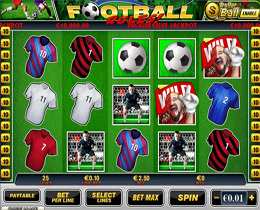 Football Rules has exciting features, such as Wilds, Scatters, a Bonus round, a Progressive Jackpot and includes the popular Dollar Ball Side Game. It is definitely worth playing, as the top line reward is worth 10,000. Every time a winning combination is formed you will be entertained with sound effects that will make you feel as if you are in the actual stadium. The crowd will cheer, the ref will blow the whistle, and he even gives players the red card when necessary. Football fans will love this Online Slot. The high quality graphics make the icons stand out clearly on the screen and you will see the Stadium, the Referee, Goal Keeper, a Football, a Trophy and of course the Fans. To enter into the Dollar Ball Jackpot round, you will need to have 5 winning numbers show up on the screen.